Ask Priscilla! Does my student need a first aid kit? 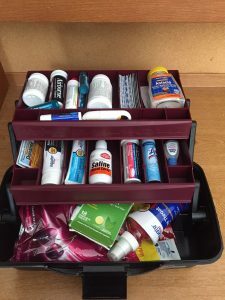 Whether your student is just starting at Missouri State and moving in to the residence halls, or they are an upperclassman and are moving in to an apartment, a first aid kit is a great and very useful gift to give your student. You as the family member know what they like when it comes to cough drops, headache medicine and band-aids. You’ve purchased these items for your student for the first 18, 19, 20 years of their life. Who better to put together a kit that has everything they need? Plus, this kit will save them from 1) having to run to the store and get the items they need (just as a note, the Magers Health & Wellness Center Pharmacy also has the items they need when they aren’t feeling good), 2) borrowing from friends and 3) feeling really bad (especially if they wake up in the middle of the night not feeling well). And the list could go on and on and on. Like I mentioned, you know your student better than anyone so you know what would be best to put in the kit. Your student might not seem very excited about the kit when they get it, but trust me, they will appreciate it and you when they need something that’s in the kit. If you have a question to Ask Priscilla, email pchildress@missouristate.edu.